Crescent roll dough is lined in a baking dish, topped with cooked breakfast sausage, hash brown potatoes, eggs and topped with shredded cheddar cheese! This simple breakfast casserole is perfect for breakfast, brunch or overnight guests. This is one of my favorite breakfast dishes. I usually make this when we have company or on any given holiday for breakfast. It's so simple to throw together and your guests will love it. I have been making this casserole for so long that this is the first recipe that comes to mind when I want to wow overnight guests. I found this recipe years ago in a 2003 Taste of Home 50Th Anniversary Cheese Cookbook. It was titled Grandma Mack's Breakfast Casserole. Who is Grandma Mack you ask? Well, she is a proud Wisconsin Dairy Farmer so they utilize cheese in most of her recipes including this one. I can tell you one thing Grandma Mack sure can cook!! I fell in love with this recipe the first time I made it, now it's a regular breakfast dish in our house. Serve this breakfast meal with fresh fruit on the side, sweet rolls or danishes. I always serve Sweet Cooked Apples along side this dish, so I'm adding that recipe as well at the end of this post. I don't have a photo of the apples, but they just apple pie without the crust. My mother in law loves this recipe so I always try to make it when she comes down to visit. You can prepare this recipe the night before which saves on time. I don't assemble the entire casserole the night before. I just brown up the sausage and store it in the refrigerator, make sure my cheese is shredded and thaw my hash browns in the fridge as well. That way in the morning its a snap to throw together. Start by preheating the oven to 375 degrees and brown and drain the sausage. Arrange the crescent rolls on the bottom of a 13 x 9 x 2-inch baking pan. Make sure to seal the seams. Place the ham or browned sausage on top of the crescent rolls. Beat the eggs and milk together; set aside. then pour the egg mixture over the hash browns. Top with shredded cheese. Bake at 375* for 30 -45 minutes or until egg mixture is done. use a knife to check if casserole is completely cooked. Sometimes the middle can be a stickler when using a smaller dish. If the egg mixture is still a bit runny lower the temperature a bit and cook a little longer that is why the cooking time can vary from 30 - 45 minutes. Let cool and cut into squares. Arrange the crescent rolls on the bottom of a 13 x 9 x 2-inch baking pan making sure to seal the seams or use seamless crescent roll dough. Place the cooked sausage or ham on top of the crescent rolls. In a separate bowl beat the eggs and milk together; set aside. Layer the hash browns over the meat, season with salt & pepper then pour the egg mixture over the hash browns. Top with cheese. Bake at 375° for 30 minutes. Cook's Note: Make sure to press the rolls together at the seams after unrolling the dough or use seamless crescent roll dough. If cutting the recipe in half use a 8 x 8 inch pan. You will have two crescent triangles left over. Use 3 eggs cut the milk to 1/4 cup. Use the same amount of sausage, hash browns and 1 1/2 cups cheese. Place apples in a 2 1/2 quart pot. Combine sugar, cinnamon, cornstarch and nutmeg. Sprinkle over apples add water and dot with butter. Cover and bring mixture to a slow boil, then turn the heat down on low and simmer until the apples are tender and the water has cooked down. Gently mix so you don't break the apples up. You can adjust the spices and sugar to your tasting. I think I added a little more cinnamon and sugar as the apples cooked. To make things easier on my son and his wife, (her family lives here too), I have started to have a Breakfast on Christmas Day, instead of a dinner. I'm definatly going to put this on the menu. It looks great! That looks so good! A great comfort breakfast, especially with those cinnamon apples, yummy!! Looks delish! I have something similar to this and my kids love it. I will try yours. that looks wonderful! I wish my family were breakfast eaters. I mean, breakfast BESIDES cold cereal. . .
That is a perfect brakfast recipe for my bunch-I am going to surprie them-they will love it! Thanks for the recipe! 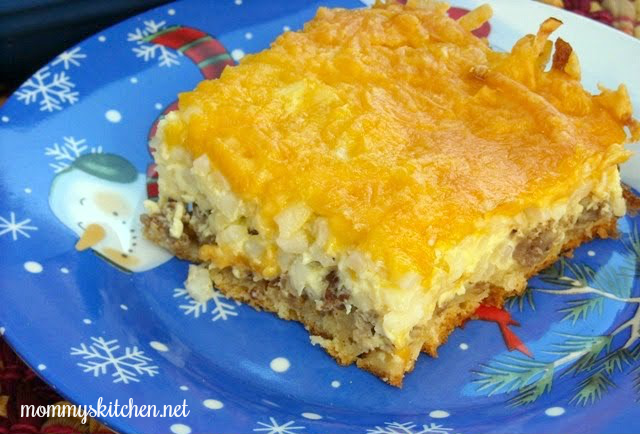 This is the breakfast casserole I make and I agree this is soooo yummy!!! My family loves this casserole. I fix this often for supper and if we happen to have leftovers, it's great heated up too. I love this breakfast casserole. I posted one very similar a few weeks ago but I can't even remember the difference. It's subtle whatever it is. And this looks so good!!!!! The recipe has the correct size pan (9 x 13 in) I just noted that I used a 8x 8 inch pan to half the recipe. Oh yummo! This looks and sounds like a super comforting dish! That looks great, I love that it has an actual crust. I am going to try that one. I think my family would love it. And those apples look good too. I have never had fried apples like that. this looks and sounds like a great dish!!! WOW!! Thank looks really good - will definitely have to try it. I usually like to make something special for breakfast one mourning a weekend. Any breakfast casserole with hash browns included is OK in my book. This looks great! Thanks for sharing the recipe! I was just wondering if you could make this casserole the night before and cook it in the morning?? ?Has anyone tried this? Thanks!! Sorry everyone I just asked if you could make it the night before and then I went back to the recipe and read the entire recipe again and I found the answer. You can precook your sausage and thaw your hashbrowns and then assemble in the morning. Sorry...no wonder I did not make better grades in school...haha! I definitely tried this.. my husband loved it. We had it for dinner one night and I loved how easy it was to put together. I thought it was a bit dry, so Im going to try adding sour cream to it next time. But other than that.. will do again.. you were right too.. sweet does goes with this definitely! Made this last night, it was great we all really enjoyed it. Will become our new comfort food. Thanks for the recipe. I made this recipe this morning and it was absolutely delicious. I had many breakfast pizzas before but have never thought to put hashbrown potatoes on it before. Thank you for the recipe. Definitely gonna try this on on Christmas morn! Gonna cook it while the kiddos are opening their presents! I have made this several times. My co-workers loved it as well as my church family and especially my husband and have had to share the recipe/site with many. I'll admit, I sometimes cheat, especially when short on time, I'll use two deep dish pie crusts. These are great since its only hubby and I at home. Next I'm going to try the apples with it. I love this recipe! It was one I first made in High School Home Ec and have made it countless times since. So tasty and easy to make. Thank you for making Christmas 2012 breakfast delicious!! Made this and the apples and everyone loved each and every bite!!! Will continue to look at all of your recipes and continue making from "Mommys Kitchen." I truly want to try this recipe. Just would like to ask: would it possible to use egg beaters instead of eggs? Yes I've used egg beaters and it comes out the same. I have made this since the 1980's when my kids were little, and they have always loved it! We call it Breakfast Pizza, and make it on a pizza pan, but I have used a casserole dish to make it without the crust/crescent dough when I didn't have any dough on hand. My mother and my sister got the recipe from me back then, and we all make it to this day. Easy and delicious. My husband is a meat lover, so it's been modified in the last few years to add ham, bacon, and any other meats we have in the fridge, in addition to the sausage. Have you ever made this the day or before baking it? This is an easy recipe to dress up....you can add onions, jalapenos, tomatoes or change out the sausage for bacon, ham, or a combination of the three! It's so versatile! We are doing breakfast for our Christmas gathering this year....we have done it once in the past, however my husband is on the evening shift of a 24 hour rotation office, so we have to dine with him in the morning. I'm thankful that he's working. Blessings to all this Christmas! Tina, this looks scrumptious. Never thought about adding slices of granny smith apples. But it makes total sense! Pork (sausage) & Apple are inseparable pair. Thanks for a great recipe! 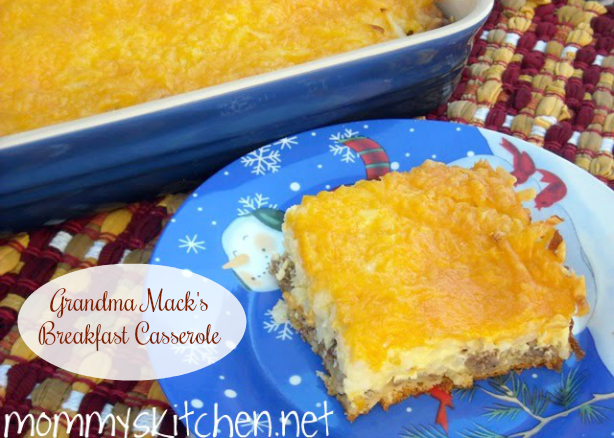 This is one of my family's favorite breakfast bakes! Truly scrumptious and simple for me to make. I had lost the recipe and am so glad to have found it again on your page! How do you keep the crust from burning while getting the eggs done? I have made this many times and have to cook longer than the 45 min. @Lue Peabody, make sure you place the casserole on the middle rack of your oven. You can also place the casserole dish on a baking sheet and then add it to the oven. Also if you are using a glass or ceramic casserole dish you need to reduce the baking temperature by 25 degrees.